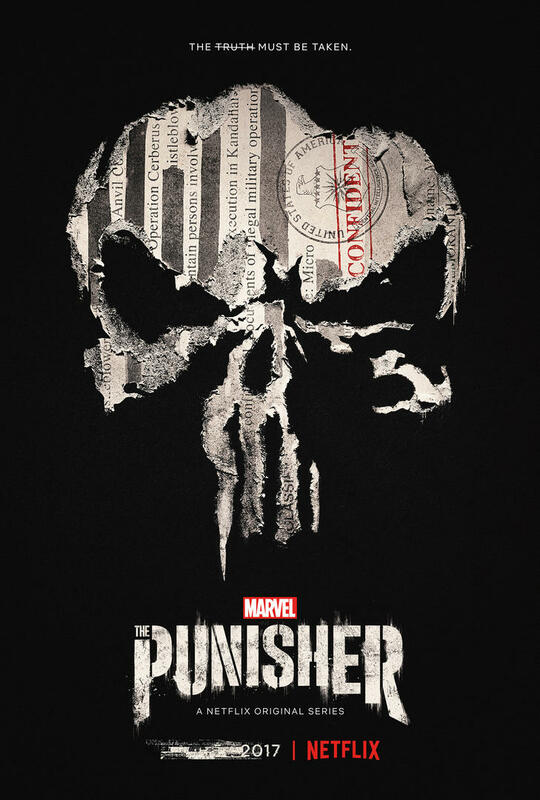 Chrichton's World: Review The Punisher Season 1: Not exactly what I hoped it would be but adequate enough! Review The Punisher Season 1: Not exactly what I hoped it would be but adequate enough! Daredevil Season 2 gave us the latest incarnation of The Punisher being played by John Bernthal. He was phenomenal and I was very much looking forward for to learn more about him and what would make him tick after his vendetta was over. Apparently his vendetta was far from over and we have to wait for season 2 for Netflix to actually give us something fresh and new. This first season is filled with brutal violence and some punishments. Certainly gratifying. But these elements can't hide that there is very little story and substance to The Punisher. There are hardly any surprises. And almost everything can be predicted right from the start. The biggest problem for me is the fact that Frank Castle is still in the middle of his own vendetta and has barely evolved from the little adventure he had in Hell's Kitchen. Almost like that never happened. Even when they reference to it whenever they can. We know this story already. As tragic and dramatic as it is, for me it's not that compelling any more. Perhaps this is why the show also has a subplot about another soldier suffering from PTSD. A huge distraction that feels like filler which has very little to no impact on the main story at all. Why not give us The Punisher and his never ending quest to antihalte every criminal element that deserves it? And then have friends and allies discuss his methods. Or why not introduce a villain so evil and brutal that would actually make people cheer for Frank Castle to save the day? Because is that not the real threat or fear normal citizens have? That one day we lose our faith in the law and take it in our own hands. The majority of the villains in this show are too nice and friendly for my taste. Even the main ones weren't nearly as conniving and despicable as they could have been. Another problem is that none of the characters we are introduced to add something significant substance wise. You pretty much know what you need at their introduction and don't really have that much depth to them. Except Ben Barnes as Billy Russo was compelling but they didn't went deep enough. If you aren't familiar with the comics then his name won't mean a lot. But if you did see the films then his name might ring a bell. If for some reason you still are in the dark then the finale will make it very obvious who Billy Russo is supposed to be. They changed his origin story to perhaps give it more impact and who knows that might happen. Doesn't negate the fact that the whole main plot could have been resolved in 4 or 5 episodes. Since this season consists of 13 episodes that means a lot of padding had to be done and that is exactly what it feels like. It takes far too long for events to happen and when they do they don't move along as fast as they should. The only reason you don't get super bored is because of the acting and some nice dynamics between the characters. And the brutal action of course. I liked the David Lieberman storyline. How he was in the same boat as Frank but went about his revenge the best way he could. At least he had a real goal you can root for. I am a little torn. On the one hand I did find some enjoyment. On the other hand I feel like they haven't brought us anything new or fresh. It could very well be that The Punisher doesn't work on his own and that another hero is needed to show the contrast. Maybe Season 2 will deliver what I hoped for. For now The Punisher was adequate enough.